Are you a friend to someone? Do you look for the best in others? Do you have the ability to love someone different than you? If you answered "yes" to these questions, then you have what it takes to be a BUDDY to one of God's special children at Camp Luther's His Kids camps or retreats! Many individuals, children of God with special needs, do not have the opportunity to enjoy some of the outdoor activities that we take for granted. For example, shooting a bow, hiking the woods, sleeping in a cabin, canoeing, learning about Jesus through song and study, making crafts and meeting friends! At Camp Luther, God's special children get the chance to enjoy doing all of these things, and most importantly, they get a chance to do that with their BUDDY: YOU! Come and volunteer for 3 or 4 days and experience the joy of walking with one of God's children as they experience the world through outdoor ministry. 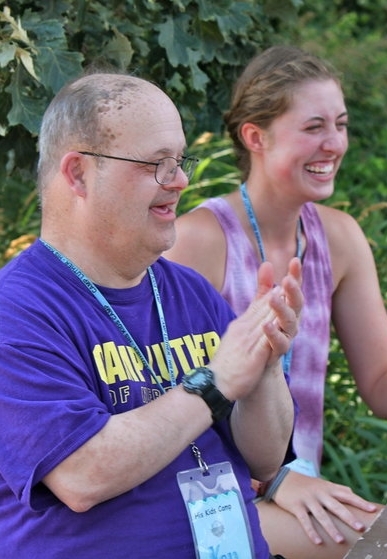 Camp Luther needs at least 20 volunteers per session, so please prayerfully consider joining us to share God's love and beautiful creation with those with special needs. Training will take place on the first night, and then campers arrive the next morning. After the campers leave, volunteers are asked to fill out a report form and help straighten up, then are free to go. Volunteers must be entering high school or older. If you have any questions regarding the process or the program, please call us at 402-352-5655 or e-mail campluther@campluther.org.